The Wiley-Interscience Paperback Series consists of selected books that have been made more accessible to consumers in an effort to increase global appeal and general circulation. With these new unabridged softcover volumes, Wiley hopes to extend the lives of these works by making them available to future generations of statisticians, mathematicians, and scientists. ". . . a goldmine of knowledge on accelerated life testing principles and practices . . . one of the very few capable of advancing the science of reliability. It definitely belongs in every bookshelf on engineering." ". . . an impressive book. The width and number of topics covered, the practical data sets included, the obvious knowledge and understanding of the author and the extent of published materials reviewed combine to ensure that this will be a book used frequently." A benchmark text in the field, Accelerated Testing: Statistical Models, Test Plans, and Data Analysis offers engineers, scientists, and statisticians a reliable resource on the effective use of accelerated life testing to measure and improve product reliability. From simple data plots to advanced computer programs, the text features a wealth of practical applications and a clear, readable style that makes even complicated physical and statistical concepts uniquely accessible. A detailed index adds to its value as a reference source. 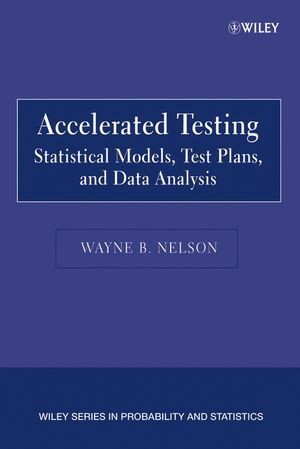 WAYNE B. NELSON, PhD, is a leading expert on analysis of reliability and accelerated test data. Formerly with General Electric Research & Development for twenty-three years, he now privately consults on and teaches engineering applications of statistics for many companies, professional societies, and universities. For his outstanding contributions to reliability data analysis and accelerated testing, he was elected a Fellow of the Institute of Electrical and Electronics Engineers, the American Society for Quality, and the American Statistical Association. 2. Models for Life Tests with Constant Stress. 4. Complete Data and Least Squares Analyses. 5. Censored Data and Maximum Likelihood Methods. 7. Competing Failure Modes and Size Effect. 8. Least-Squares Comparisons for Complete Data. 9. Maximum Likelihood Comparisons for Censored and Other Data. 10. Models and Data Analyses for Step and Varying Stress.